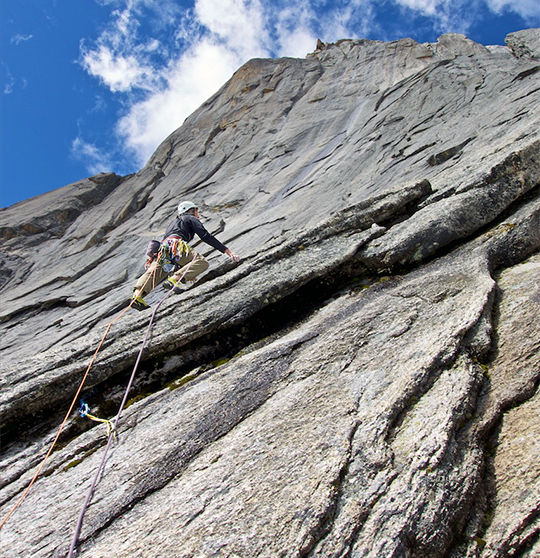 September 23: Twenty meters above the belay, I hear metal scraping against rock as moss and dirt rains down. "The crack is just a seam," my fiancee Szu-ting Yi calls down while stabbing the shallow corner with her nut tool before retreating back to the anchor. Earlier that morning, after jugging four fixed ropes, we ascended more than 450 meters of previously unexplored granite cracks up the Southeast Face of Eagle Peak East (5300m), in the Qionglai Mountains of China, and now we're stuck. We sit in silence on the dead-end ledge and munch on moon cakes, small pie-like pastries, and contemplate our next move. Looking for options, we spot a line to our right and soon I'm deciphering dimples along a slab and committed to an irreversible sequence. Eight meters of unprotected climbing takes me around a corner where I'm finally able to set a cam. Looking up, I see cracks weaving to the summit and continue the lead. 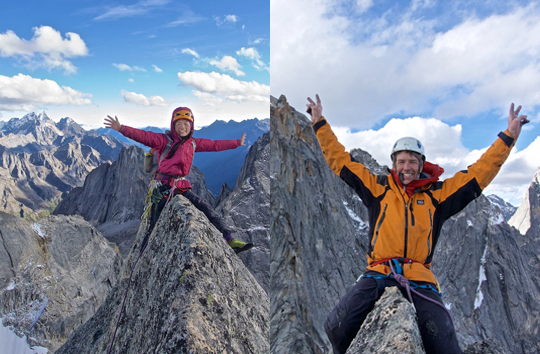 Soon we're straddling the summit fin in last light having completed Secret Moon Cake (5.10 R, 760m). Our route was established without the use of bolts. Sitting next to me, Szu-ting sets a large nut in a crack, near two suspect bolts placed by another team, to use as our rappel anchor. We had heard rumors of poor quality bolts in the area, so we avoid them and rappel off our gear instead. Near midnight, we're back at our tent as rain slashes across the fly and thunder echoes down the valley. I first saw Eagle Peak East in the fall of 2013. Szu-ting and I had just completed the first ascent of Dayantianwo (5240m), up the peak's South Face by our route Three Sheep Bring Prosperity, (5.10 X, 60 degrees, 600m). Looking north from the summit, we noticed a shark's tooth spire, Eagle Peak East, the largest in the Eagle Peak group, and wanted to climb it. We could see a series of crack features weaving up the southeast face that became discontinuous near the top. I took a few photos and filed the information away for the future. The peak, also called Wagrusei, had only one ascent by a Japanese team in 2007. According to an online report, a five-person team climbed Kyousai, (5.10c A1, 680m, Hirayama-Nagatomo-Ouchi-Ouchi-Senoh, 2007) over two days. The route was authored with the use of a power drill. For the last four decades, foreign and Chinese climbers alike have been drawn to this area to climb the highest peak in the region, Mt. Siguniang (6250m). The peak was first climbed in 1981, via the East Ridge, by a Japanese team. 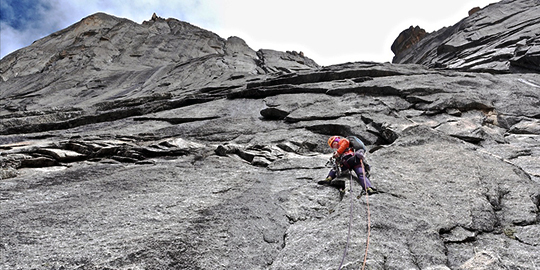 The peak also contains many alpine routes, including Mick Fowler and Paul Ramsden's 1,500-meter ice route up the peak's North Face and the late Chad Kellogg and Dylan Thomas's line up the Southwest Ridge. "The mountain has two obvious rock strata," Jon Otto wrote of Mt. Siguniang in the 2005 American Alpine Journal. "The lower layer seems to be granite or a hard conglomerate of excellent quality, while the upper layer is a brownish, fragmenting, at places almost shale-like rock of poor quality. 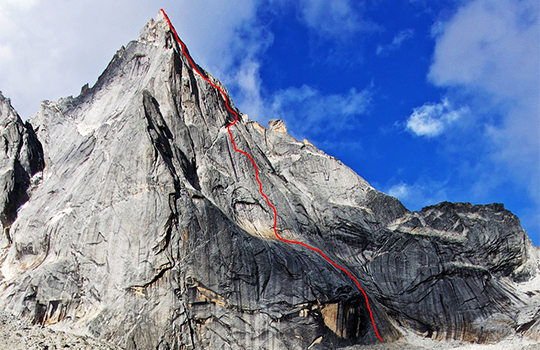 The dividing line between these two rock types is around 5,200m." During summer and early fall, the region receives heavy rainfall, which grows moss and lichen in cracks.